Today is IPA Day, a holiday celebrated by many on the first Thursday of August since its founding in 2011. Earlier that very year, The Bruery’s founder Patrick Rue resolved to never brew an IPA. Much has changed since that inaugural IPA Day, but the India pale ale (and its many derivatives) is still far and away craft beer’s most popular style. And Rue, to his credit, has kept his promise. Rather than compromise The Bruery’s vision, Rue instead created an offshoot brewery–named, appropriately, Offshoot Beer Co.–that only makes IPAs. Offshoot kicked things off in April with the tongue-in-cheek release of two cans: Better Late Than Never and Fashionably Late. Late though they are, Offshoot has made up for lost time by turning out a variety of hazy IPAs brewed with a bevy of trendy hops. The brewery’s June releases of Hall Monitor and Line Cutter came just in time for back-to-school season. 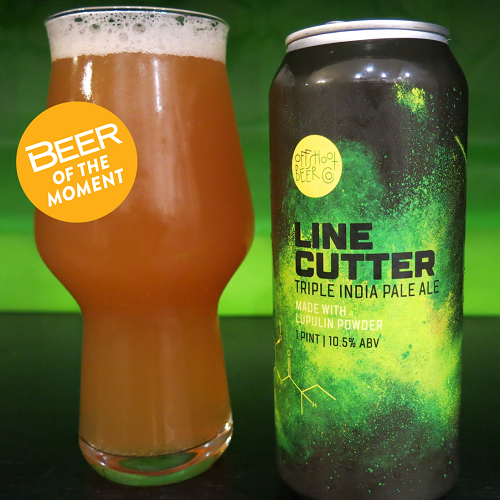 Line Cutter, in particular, displays two trends we’ve seen a lot of lately: it’s brewed with lupulin powder, and billed as a triple India pale ale. Triple IPAs are nothing new, of course, but have fallen out of favor in recent years. Once upon a time, brewers engaged in an arms race to see who could create IPAs with the highest IBUs. But today, brewers are scaling back the bitterness in favor of lush aromatics and juicy characteristics, which come to Line Cutter by way of Citra, Mosaic, Simcoe and Cashmere hops. Despite coming in at 10.5%, Line Cutter doesn’t have the caramel-laden quality of triple IPAs past, many of which bordered on cloying. Still, there’s no hiding the beer’s strength here, with the alcohol apparent on the nose. On the palate there’s orange peel and a big punch of pineapple, with canteloupe and a sprinkle of white pepper. There’s little malt character to speak of, just a bit of sweetness and a honey-like character that works well with the juicy hop profile. There’s little body, too, or at least not as much as you might expect of a 10.5% triple IPA. Like other Offshoot releases we’ve sampled recently, Line Cutter is a fun and distinctive new offering. And it’s one that makes us happy Patrick Rue didn’t entirely keep that promise he made so many years ago.